Labor Day is the first Monday in September. It is a federal holiday to celebrate the economic and social contributions of American workers. Lots of Americans think of Labor Day as the end of summer, so they celebrate with parades, family gatherings, celebrations and shopping trips. 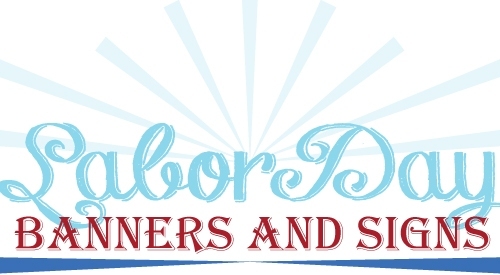 Here are some of the most common ways you can use Labor Day banners and signs. Lots of towns and cities have parades on Labor Day. If you are having a float, you can put a sign or banner on your vehicle or trailer in the parade. You can also use signs for registration booths, entrances, exits and bathroom locations. Ironically, Labor Day is one of the biggest sales weekends in the United States. If your company is having a Labor Day Sale, be sure to put up banners and signs to let people know when the sale is and what types of deals your store is having. You can display the signs on your window, on the side of the store or in front of the store. 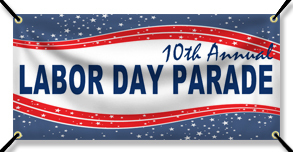 If your company, church or family is having a picnic on Labor Day you can use banners and signs to let people know when and where the picnic is going to be held. You can use signs to let people know if it is open to the public, where parking is available and what events are going on throughout the day. 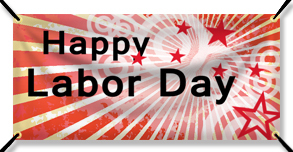 If you want to wish people a happy Labor Day, you can also display a yard sign or banner in your yard. We have lots of Labor Day banner templates available for you to customize. Click here to get started.